I know it's only April. 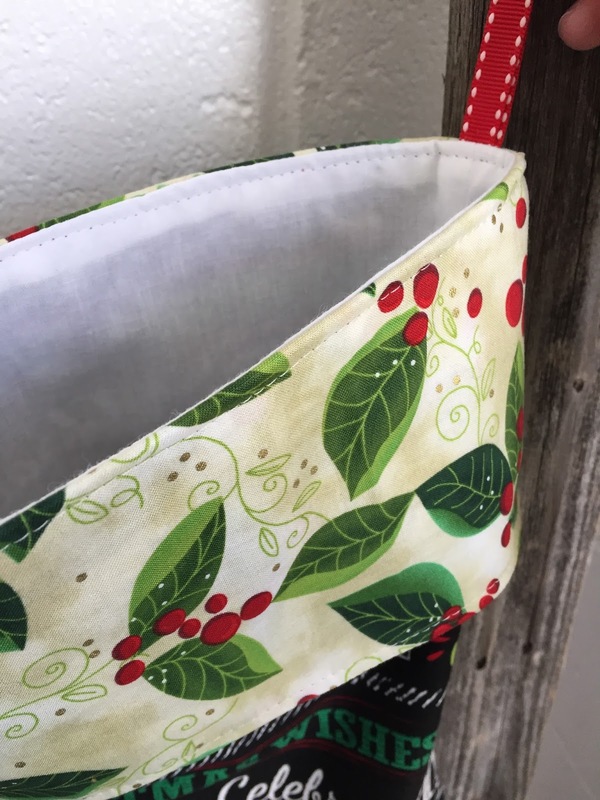 But if you're anything like me, what happens is you have all these great ideas for handmade Christmas items and you put them off until December 20-something, and then you run and buy people gift cards never get to them. 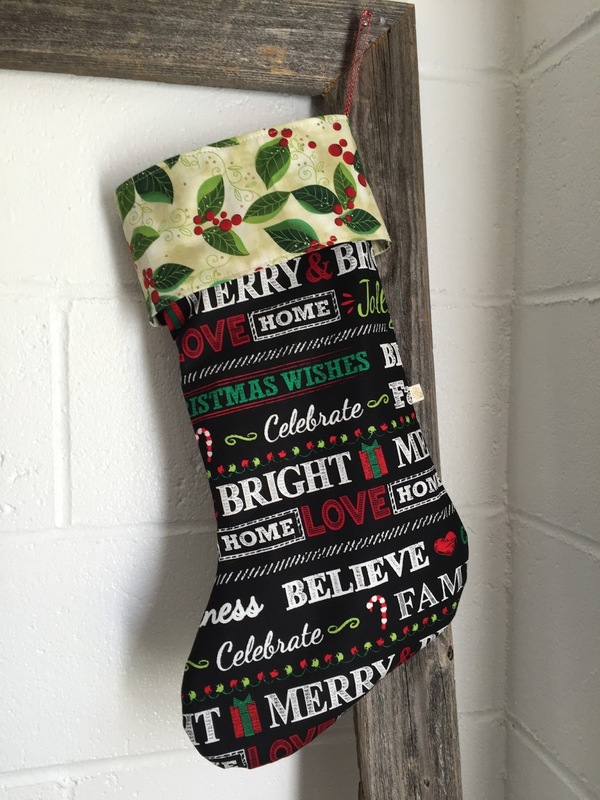 So I'm giving you plenty of time to work on Christmas stockings this year. Mostly because of my pushy sewing students who wanted to take handmade Christmas to a whole new level this year. You two know who you are. A note about me: I hate raw edges. I don't like seeing them. It makes things seem not as well made as they could be. And so when we were planning out stockings, and a cuff was mentioned, I cringed. 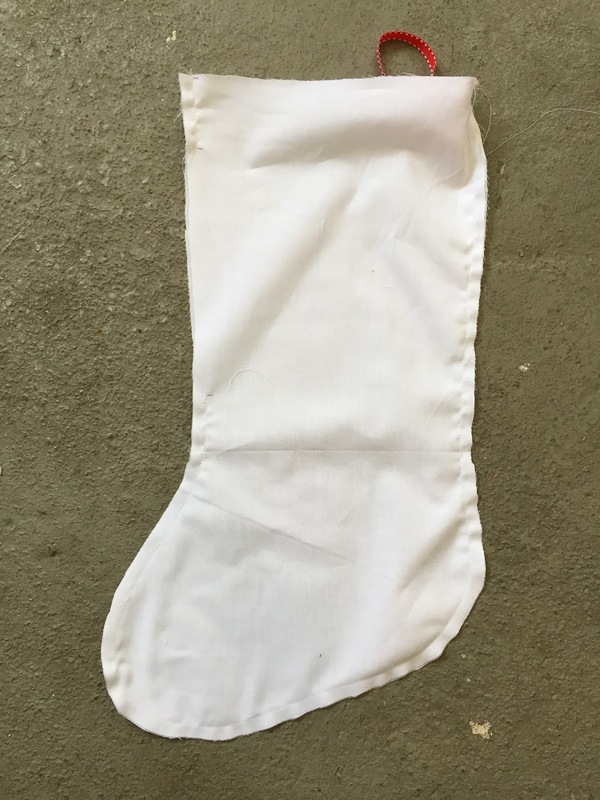 Because on all of the stockings I had seen, if you pick the cuff up, there were raw edges under there. And that's totally fine! 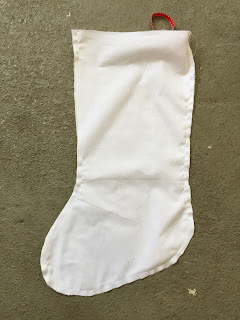 Because who besides me is going to look at the underside of the cuff of a stocking to inspect whether or not there are raw edges? No. One. I have problems. 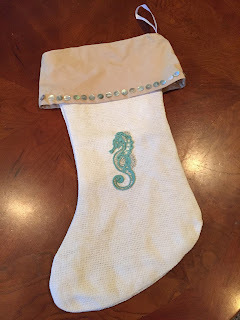 But if I was going to design a stocking with a cuff, it couldn't have raw edges. Because I'm crazy. There were a few failed attempts. And some unsavory words, I must confess. And then some praying to sweet baby Jesus to forgive me. And then a stroke of genius from one of my students that got us halfway there. And finally in the car ride home from class, I figured it out. So here we are. You guys had no idea it was such a process, did you? Pattern writing is no joke, trust me. I have a ridiculous new appreciation for the people who do it for a living. 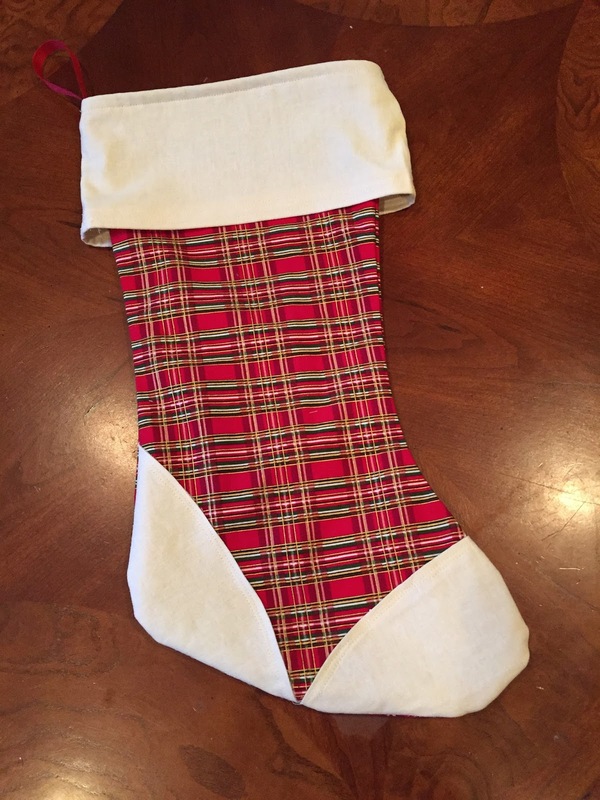 I made up a sample of this cuffed stocking, using two Christmas fabrics, muslin for the lining, and ribbon for the hanger. They are getting all fancy with appliques and trim. Once you learn the basic construction, the sky's the limit on the embellishments. But let's start with construction. 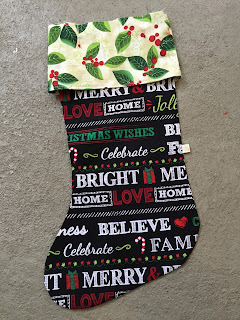 3/4 yard of outer fabric for the main stocking piece. 3/4 yard of lining fabric. 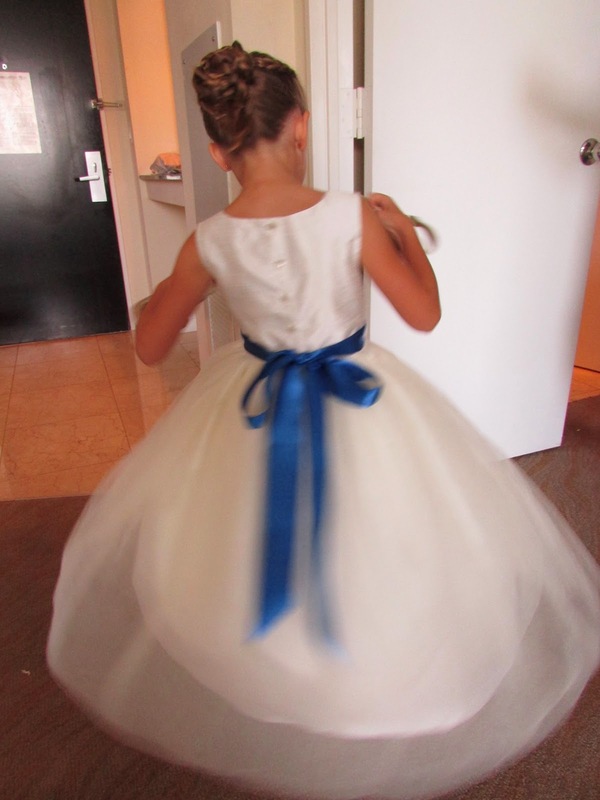 I just used white muslin. 1/4 yard of cuff fabric. a 9" length of ribbon. all the usual sewing bits and pieces. I started with a stocking I liked the shape of. I placed it down on a piece of tracing paper and traced around it with a pencil. 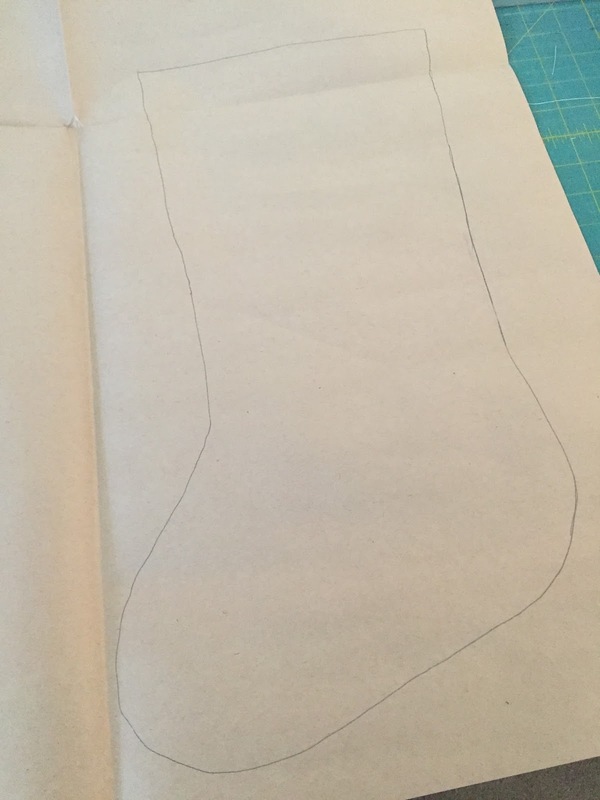 Then I used my gauge (or ruler) to add a 1/2" seam allowance around the entire edge of my stocking (the dotted line). 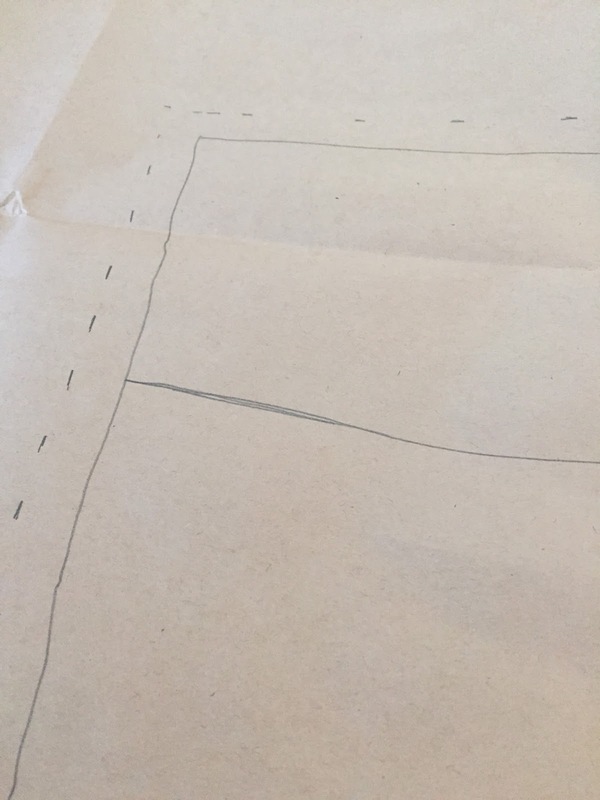 I also eye-balled where I might want the cuff to be, and drew a line across my pattern piece there. Using paper cutting scissors (not ones I use for fabric) I cut out the pattern on the dotted line. You can see my original traced line is still intact. 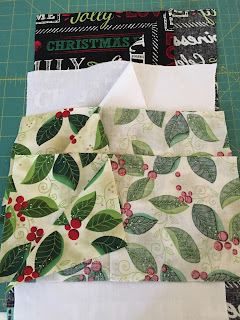 I folded over just enough of my fabric for my pattern piece to fit on it, placed the pattern down and cut around the pattern using fabric scissors. I repeated the process for the inner stocking pieces...fold...lay...weigh - this was new, should have done that originally - and cut. Next I took the pattern piece and cut it the cuff line I had made earlier. I found it helpful to mark an arrow to show where the top is. For the cuff, I cut 4 pieces. I started the same as the stocking inner and outer - folded my fabric right sides together and placed the cuff pattern piece down, arrow is pointing up. Then, I added 1/2" to the bottom of the cuff, (straight red line) and also I added a 1/2" flare to the bottom of both sides. 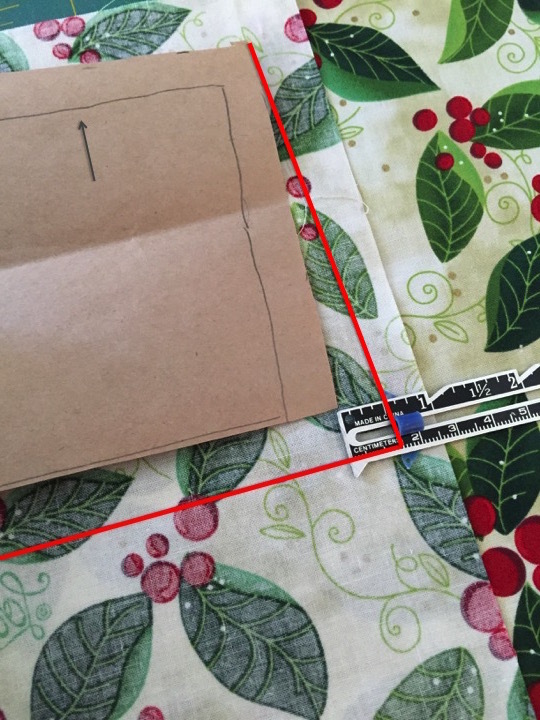 I used a ruler to draw a line from the 1/2" flare to the top point of the paper pattern piece. (slanty red line) I did this on both sides. 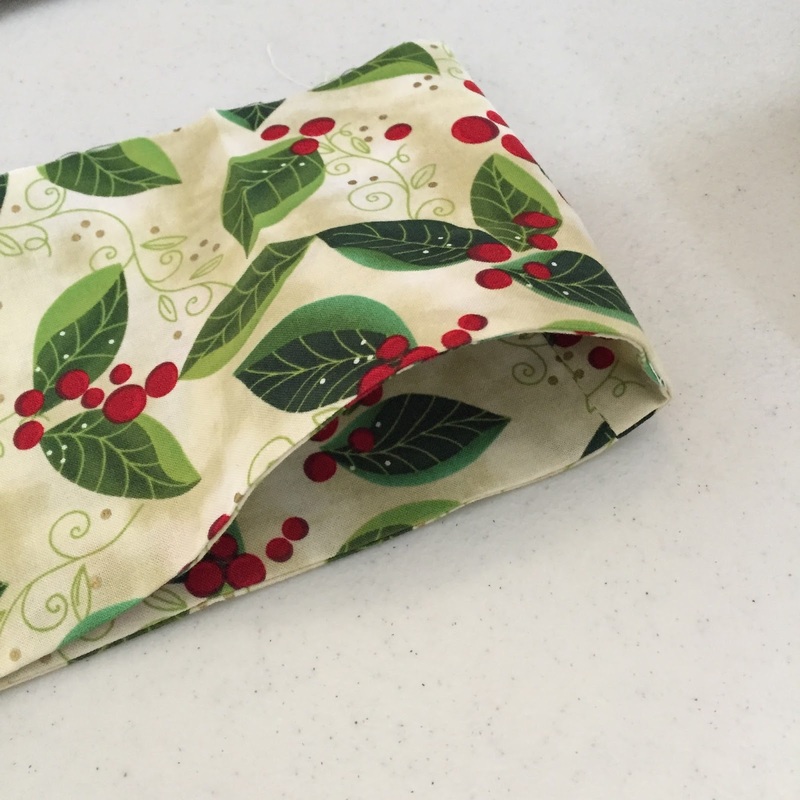 This gives your cuff a little bit of extra room around your finished stocking, but not much. You can make the flare 1" if you like. 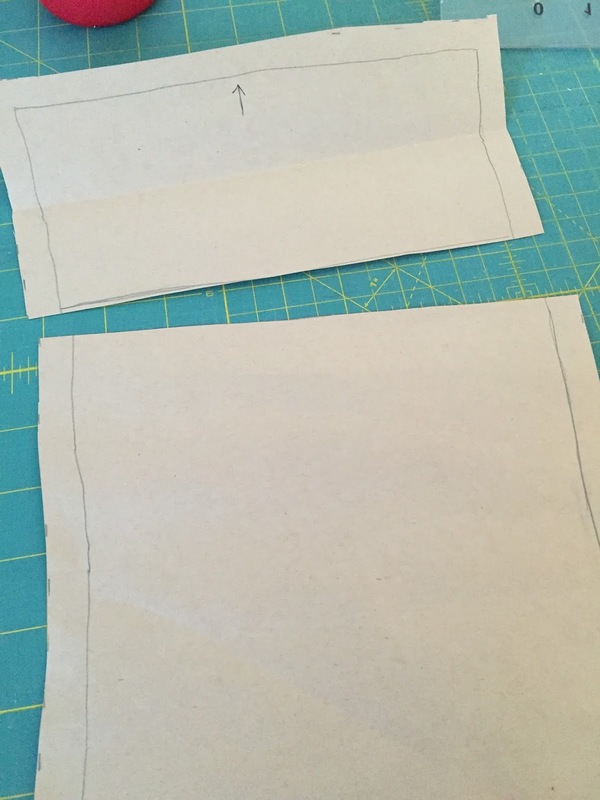 I cut out one cuff set using these traced lines and the paper piece, and then I used the cut out fabric pieces to cut another cuff set. You will have 4 cuff pieces all together. If you're staring at the computer screen, hating everything about the cuffs - skip them. 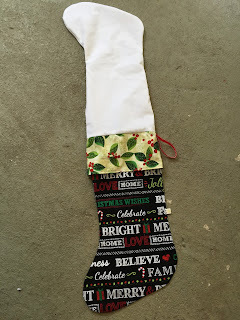 You can make this stocking without the cuffs if you like. No worries. Just let them go for now, skip all the cuff assembly pictures to follow, and skip right to the main stocking pictures. I won't tell anyone. The cuff made me quite grumpy while we were working it out. If you ARE going to attempt the cuffs, here's how it goes. I told you earlier it might be helpful to mark the top of the pattern with an arrow? 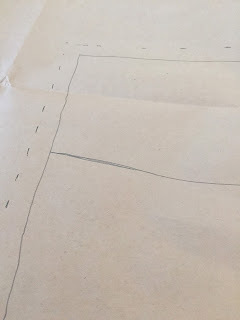 It might also be helpful to mark the pattern pieces. I didn't, but I think I will the next time. The bottoms of the cuffs are only slightly more wide than the tops and it's a little hard to tell the difference once they are sewn. 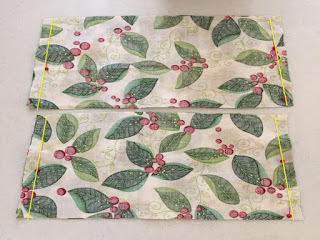 To start the cuff, take both sets of cuffs, right sides together, just like you cut them, and sew down the left and right side of both sets, using a 1/2" seam, where those yellow lines are. Leave the top and bottom open. You'll have 2 fabric tubes. Then iron your seams open. Turn one of the tubes to the right side, making sure you keep track of where your top is. Line up your seams and slide the two cuff pieces together, one inside the other, right sides of the fabric touching and top and bottom raw edges lined up. 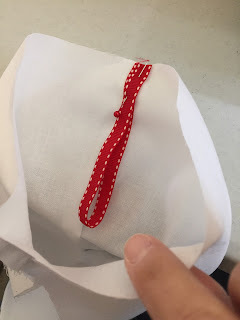 You are going to sew around the bottom edge of the cuff. 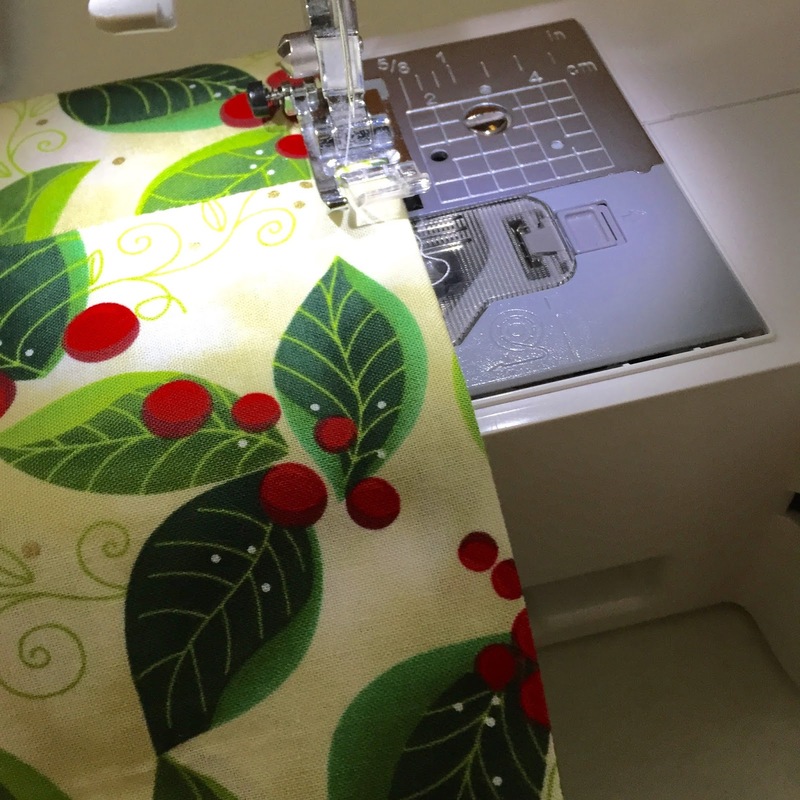 In a circle - not straight across, but slide it over the table of your machine so that you still have a fabric tube. Leave the top of the cuff tube open. See how the top and bottom stuff is important? Flip the cuff to the right side and iron the bottom seam so it's nice and crisp. Pssssssst...that inside part? That will wind up being the underside of the cuff and nary a raw edge in sight. Glory! Then top-stitch this seam. Set your cuff aside for now. Hi there! If you've skipped all the cuff nonsense, this is where we're meeting up. Ready to sew the inner stocking? Here we go! Keep the inner stocking pieces together just as you cut them. 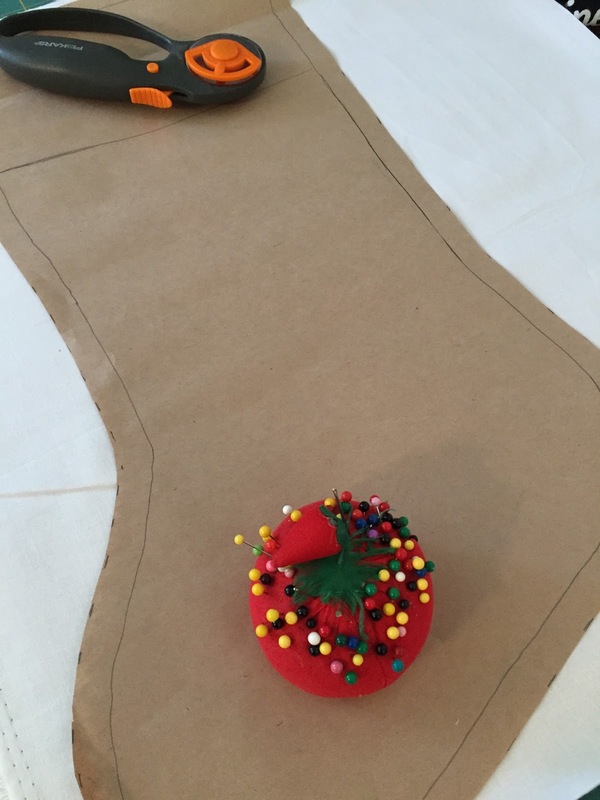 You are going to sew them together, using a 1/2" seam, down the heel side, around the toe and back up the other side. Leave a turning opening, about 6" wide in one of the straight sides. 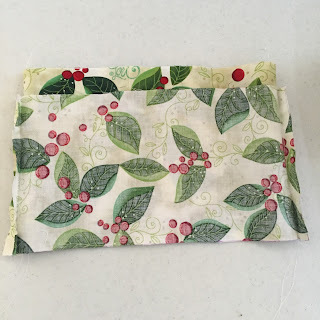 Do not sew the top closed. Next, sew the outer stocking pieces together. All the same details. 1/2" seam, down one side, around the toe and up the other side (you don't have to leave a turning opening) and leave the top open. 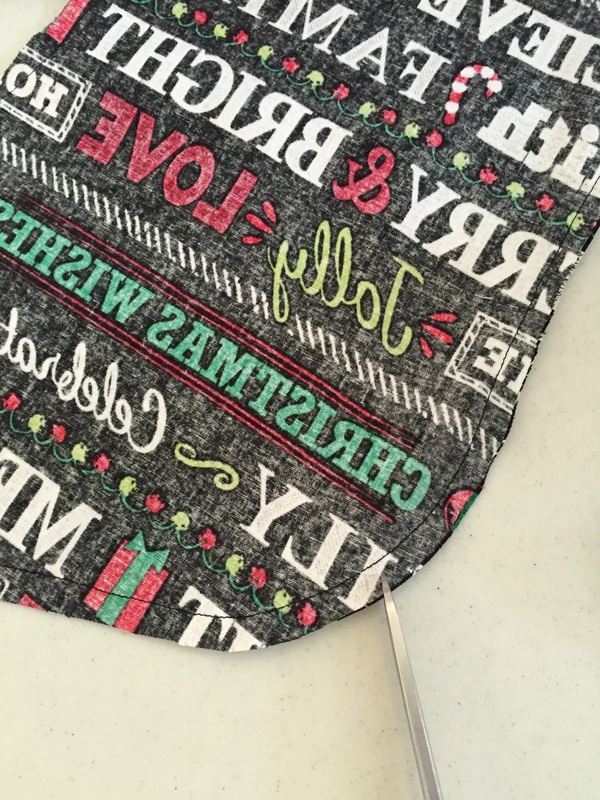 Using sharp scissors, and being careful not to cut into your seams, clip into the curves of the heel and toe of the stocking. Turn the outer stocking to the right side and press. Then, if you're using the cuff, slide the cuff tube over the top of the stocking. The raw edges of the cuff should line up with the raw edges of the stocking. Take the 9" piece of ribbon and fold it double. 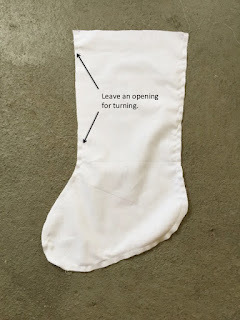 Pin it inside the inner stocking piece (the right side) along the seam of the heel side. 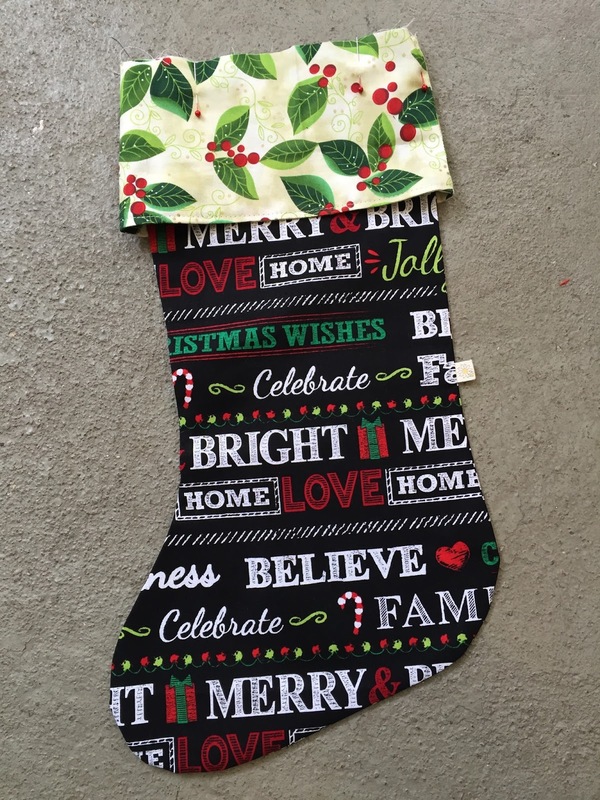 The raw edges of the ribbon should line up with the raw edges of the stocking. See here? I pulled the ribbon loop up from the inside of its hiding place so you can see where to put it. Just make sure it's tucked back in before you sew. All righty. 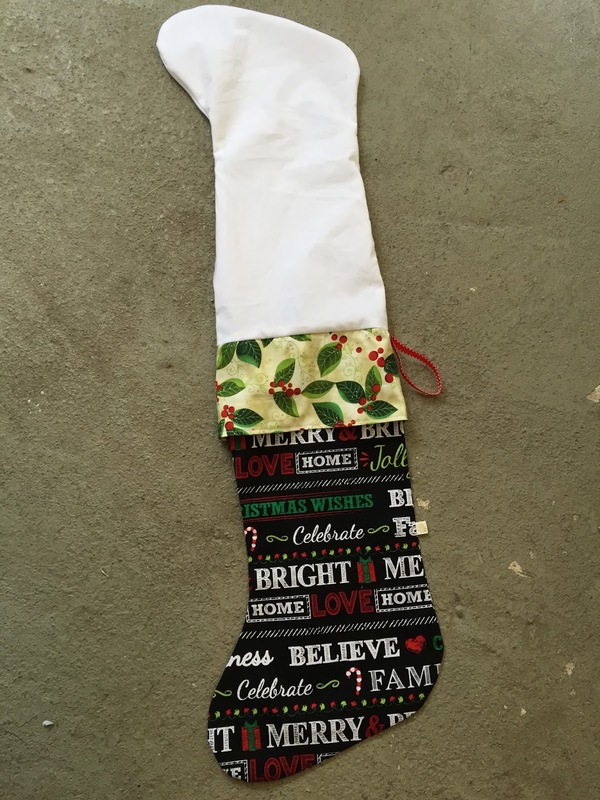 Slide the outer stocking/cuff combination into the inner stocking/ribbon combo. All the raw edges from all the things should line up at the top and all the seams should line up as well. Pin around the top edges in a circle. You can peek through your opening in the inner stocking to see all your layers, happily nestled together. Sew around the top edge of the stocking, (again, in a circle - not straight across) so that the layers are all sewn together. Remove the pins - don't forget that one holding the ribbon hanger - and then pull everything to the right side through that hole. Push all your curves out in the heel and toe and press both the inner and outer stocking. 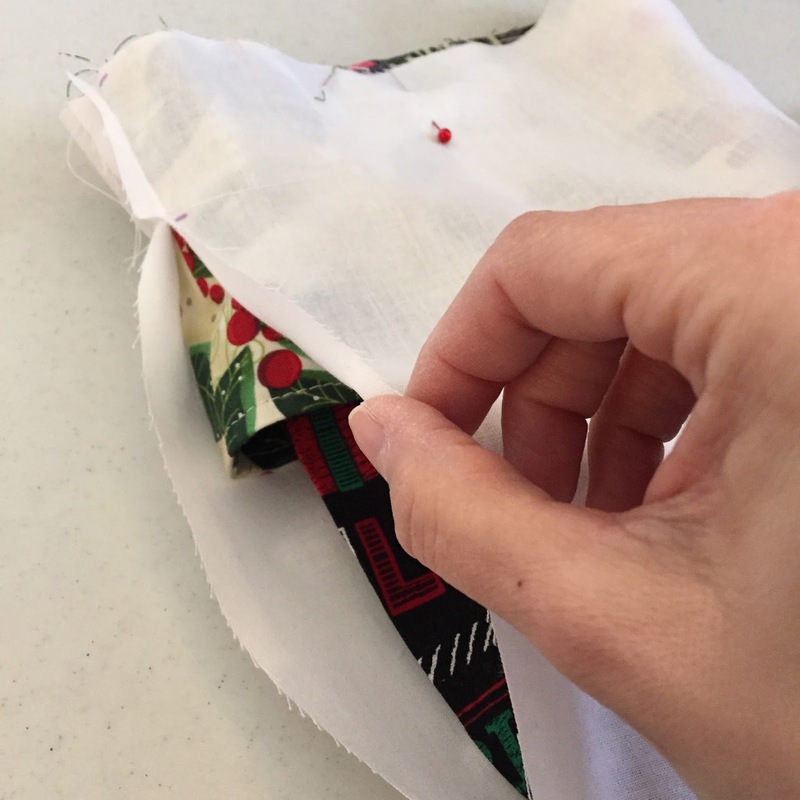 Then push the raw edges of the opening in the inner stocking to the inside, press and sew the opening closed. 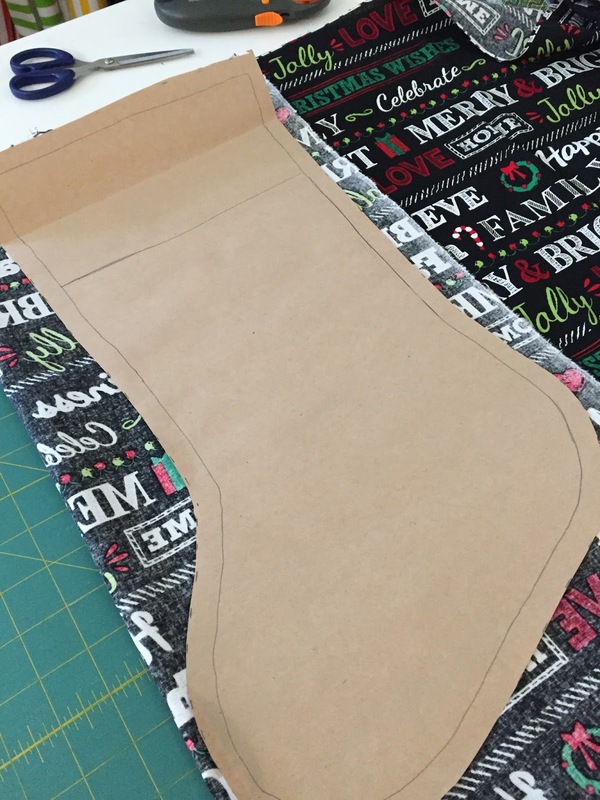 Push the inner stocking down inside the outer stocking and iron around the top seam. Here are the ones the girls are working on. Toldja they were fancy. If you decide to work on stockings this year using this tutorial, I'd love to see them!